A police chief armourer and two gun runners have been arrested by the Kaduna State Police Command during an alleged attempt to steal firearms from the command’s armoury. “Further investigation revealed that one of the two civilian suspects is a blacksmith who specialises in manufacturing locally made firearms. 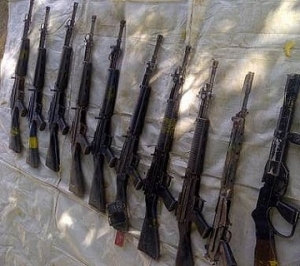 “Eleven G3 Rifles already concealed under the seat of the Mercedes Benz car and a cash sum of 400,000 Naira were recovered from the suspects,” he said. The police officials serving at the Kaduna Police Command and residents were left in shock after discovering that the man saddled with the responsibility of protecting lives and property of the police, eventually turned out to be a traitor, by supplying police firearms to criminals. This arrest is coming on the heels of a recent order of a nationwide audit of police armouries by the Inspector General of Police, Mr Suleiman Abba. Mr Shehu further said that the two civilian suspects from Jos were on sent by a traditional ruler who gave them the money to purchase the said firearms from the chief armourer. “Our men are on the trail of the unnamed traditional ruler who is now on the run,” Shehu said. About his involvement in the crime, DSP Audu, who has served the Police force for 30 years and is due for retirement in the next five years, accepted committing the illegal act. He said that his intention of supplying the firearms to the gunrunners was due to the incessant attacks on his kinsmen in Jos by Fulani men. And that the gun was meant to be used for self protection against the Fulani gunmen. Other arrests made by the command include arrests of six notorious armed robbery suspects who have carried out series of robbery operations in Kaduna and Niger States. Nine stolen vehicles, one Ak47 rifle, five locally made pistols and 1,015 rounds of Ak47 live ammunition were recovered from the suspects. The commissioner said that all the suspects would be charged to court. He, however, reassured the citizens of the state that the command was fully determined to flush criminals out of the state.